about a couch…the conclusion (part 4 of 4) | i made it so. a montage of scenes…in slow-motion, if you wish, for dramatic effect. ana [driving home, talking to the couch]: it’s ok dear. you’ll be home soon, where you will be loved and adored. we’ll forget you ever set your pretty little curlycue legs in that old thrift store. the indignity! ana: welcome home, lovely. i hope you like it here. mr.MadeItSo [forcing what he hopes will pass as a sincere smile, and trying to be supportive]: it’s not that bad, actually. a lot better than that photo you sent. ana: shhh…not in front of the couch. the couch, though a snug fit in the small living space, feels very much at home. the legs and structure are delicate and airy so that it is a lot less imposing than contemporary couches of the same size. it’s a great piece of furniture, offering plenty of seating for guests. the only thing that needs a bit of work is the foam in the cushions. ana will be replacing them eventually, and she’ll surely share the process here. the living room is divided fairly equally down the middle now, and it is easy for any visitor to guess which side of the room is influenced by ana’s taste (the old couch side) and which side is influenced by mr.MadeItSo’s (the side with the two sleek pub chairs). some may call that eclectic decor. hgtv may call it a lack of style and focus. the MadeItSo’s call it home, and wouldn’t have it any other way. 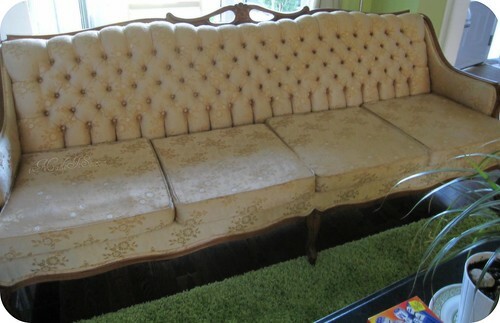 This entry was posted in thrifting & vintage and tagged old victorian couch, story. Bookmark the permalink. :-) I knew it! I mean, it isn’t like there weren’t clues (couch lifter! ), but the biggest clue was that there is no way I could imagine you, ana, lover of old things, emotional about a couch, writing a four part “farewell”. I just knew it had a happy ending and I’m glad it did! your spidey sense was right all along! Oh yay! I’m so happy for the couch and for you and your home! I think my favourite part is the cell phone part “not in front of the couch!” Ha. I’ve never seen a blog post like this. Can we enter it into some sort of blog story suspense memoir Martha Stewart meets iMadeitso contest? I think it deserves its own genre. And its own party. When you have your couch warming party, please put my name on the guest list. We could all go to thrift shops and find vintage hats to wear! 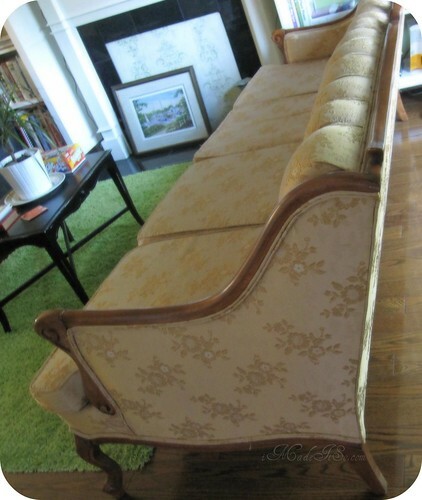 Very cool sofa, very cool blog. I’m a sucker for happy endings! And it does look light and airy somehow, that’s just perfect. I have a hard time couch shopping. I inherited my current one and my well-behaved, 4 legged angels (snort) haven’t done a thing to it so that it needs to be replaced or anything. I dread couch shopping – I can’t stand most of them. I mean, ugh. Blocky, imposing, uncomfortable, weird material or cushions – there is always something that isn’t quite right. When the perfect couch comes into one’s life it’s a gift. So, enjoy. It is a lovely find, for sure, for sure! I would have had to build an addition on the house for it, one I could lock the children out of or they’d have it in splinters inside the first day and the cushions used for a soft landing. Heathens. I fully expect another imadeitso entry in 20 years about how you’ve reupholstered it with something you’ve knit. I love it! The boy and I bought a couch much like that (French Provincial) a few months ago. I saw it on Kijiji and kept insisting that we buy it. It took him a few days to warm up to it, but I’m sure he loves it now. And really, what choice does he have? so funny to read all your comments in a row like that, as you read parts 1-4. woo! i knew (hoped) others could relate to my emotions through this thing. thanks for visiting, thursday! awwww…I’m a sucker for a happy ending. <3 And what a lovely couch. Congratulations Ana! Home SWEET Home … Love a happy ending and it IS a beauty! How lucky for ‘her’ to have your house to spend time in! It’s a beautiful couch! We had a similar couch drama in our family, but I didn’t win. Brian’s grandma Malilee was a southern belle throwback, and loved to collect elegant things. When she passed, her home was a treasure trove of amazing finds. 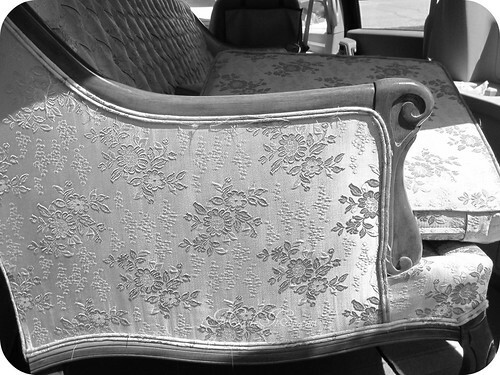 My favorite was this beautiful Victorian settee, upholstered in this lurid pink fabric. The fabric was a composite fabric made of many different colors that meshed together into this beautiful pink. 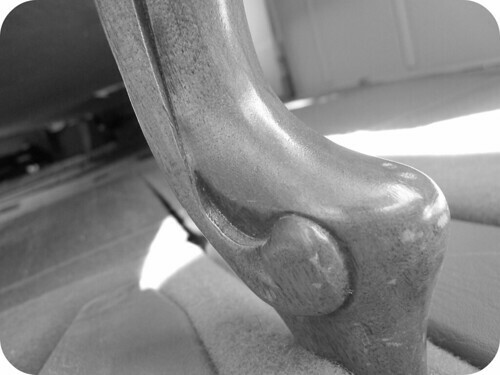 It was comfortable, with ornately carved legs (can you tell that I was madly in love?) and was wide enough to allow two large framed people to sit comfortably. It was heaven. However, Mr. (mis)Adventure just couldn’t fathom this “monstrosity” in his home. It was too old looking, and too pink. I even offered to reupholster it. He wouldn’t hear of it. My poor darling was sold in an estate sale. I still get misty-eyed thinking of that beautiful piece. Pingback: about a couch…the story continues (part 3 of 4) | i made it so. Do you think that beautiful wood is walnut, mahogany or some other wood? i don’t know for sure. i’m pretty certain it’s a reproduction, probably mass produced too because i’ve seen a couple of almost identical ones online. still love it though!